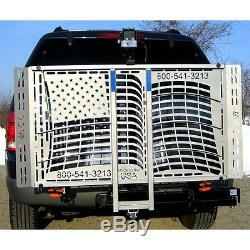 New From an Authorized Wheelchair Carrier Products Dealer. 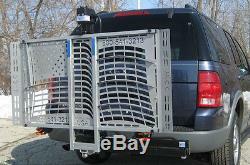 (We will need to contact you to specify your hitch size Class 2 or Class 3). 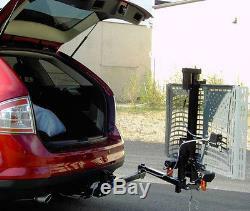 The Swingaway bracket option allows you to swing out the lift to allow tailgate access, (photo 2). We are now proud to offer the new patriotic mobility lift for transporting power-chairs or scooters! This electric lift attaches to a Class II or Class III hitch receiver and has an easy to use toggle switch for raising and lowering the lift. The toggle switch operation has a key switch which only allows the lift to be operated when the key is inserted and turned, preventing the lift from lowering when transporting. The lift also features a manual backup crank handle in case of electric motor failure. The US208 can be used to transport mobility scooters or power-chairs and can be loaded and unloaded from both sides. When not in use, the lift platform can be folded up toward the rear of the vehicle to show off the American flag cutout design featured in the platform. Electric Mobility Lift Product Features. Platforms are steel e-coated and powder coated for durability. May be used for mobility scooters or power wheelchairs. Holds up to 350 lbs. Electric lift mechanism allows for toggle switch raising and lowering. Manual emergency crank backup in case of electric motor failure. Folds up vertically when not in use. Load and unload from both sides. Optional accessories available including license plate kit, swing away option, and height adaptor. 24 of possible ground clearance. Electric Mobility Lift Product Limitations. Carrier Carrying Capacity: This lift is designed to safely carry 350 lbs. Hitch Weigh Limit: Most Class III hitches are rated for 500 lbs Most Class IV hitches are rated for 1000 lbs. Vehicle Hauling Capacity: Your hauling weight may be limited by your vehicle's capacity to carry a load. Some vehicles may require air shocks or heavier springs to stiffen up the suspension to prevent sagging. Please check with your dealer to find out if your vehicle's carrying capacity. NOT recommended for tow-behind trailers including 5th wheel trailers & camping trailers. 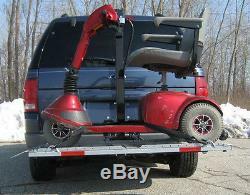 The item "Veterans Power Chair Electric Scooter Lift Carrier US208" is in sale since Saturday, June 29, 2013. This item is in the category "Health & Beauty\Medical & Mobility\Mobility/Walking Equipment\Mobility Scooters". The seller is "themedicaldepartmentstore" and is located in Venice, Florida. This item can be shipped to United States.